Dr. Xu Ma received a PhD in electrical and computer engineering from the University of Delaware. He is now with the Electrical Engineering and Computer Science Department at the University of California at Berkeley. Dr. Ma's research interests include computational imaging, signal processing, and computational lithography. Dr. Gonzalo R. Arce received a PhD degree in electrical engineering from Purdue University. He is the Charles Black Evans Distinguished Professor of Electrical and Computer Engineering at the University of Delaware and holds the Fulbright-Nokia Distinguished Chair in Information and Communications Technologies. Dr. Arce's fields of interest include nonlinear and statistical signal processing, digital printing, and computational imaging. He is a Fellow of the IEEE for his contributions to the theory and applications of nonlinear signal processing. 1.3 Resist Processes and Characteristics. 1.4 Techniques in Computational Lithography. 2.1 Partially Coherent Imaging Systems. 3 Rule-Based Resolution Enhancement Techniques. 5 Computational Lithography with Coherent Illumination. 7 Computational Lithography with Partially Coherent Illumination. 8 Other RET Optimization Techniques. 8.2 Post-Processing Based on 2D DCT. 8.3 Photoresist Tone Reversing Method. 9 Source and Mask Optimization. 11 Conclusions and New Directions of Computational Lithography. 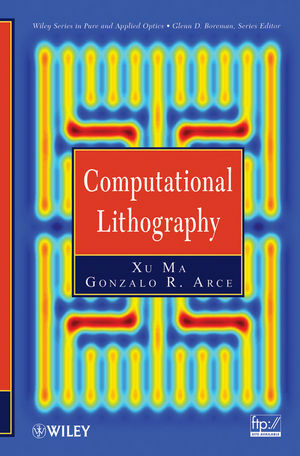 11.2 New Directions of Computational Lithography. Appendix A: Formula Derivation in Chapter 5. Appendix C: Formula Derivation in Chapter 6. Appendix D: Formula Derivation in Chapter 7. Appendix E: Formula Derivation in Chapter 8. Appendix F: Formula Derivation in Chapter 9. Appendix G: Formula Derivation in Chapter 10.